So, everyone loves a compliment now and again! “These rugs are absolutely beautiful! And even more importantly and impressive how they support local communities, teaching people new skills and at the same time producing a first world class product. Wow! 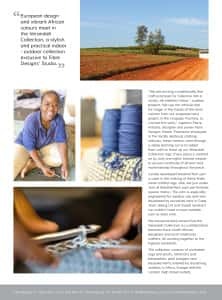 A little more info on our Woman’s empowerment project up in Limpopo…enjoy the read & please mail us should you wish to access our site. Strictly for our specials! A new Season, a new Collection! Introducing this Spring’s exquisite arrivals! 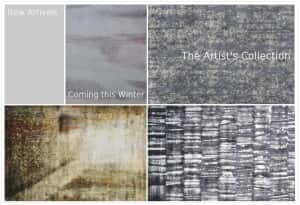 This fresh collection consists of hand-knotted rugs using an innovative combination of natural bast fibre or hemp for the field and re-purposed Sari silk the for the motifs. Our stock size is 170x240cm and, needless to say, Fibre Designs can custom-weave a rug to whichever dimensions you may require. 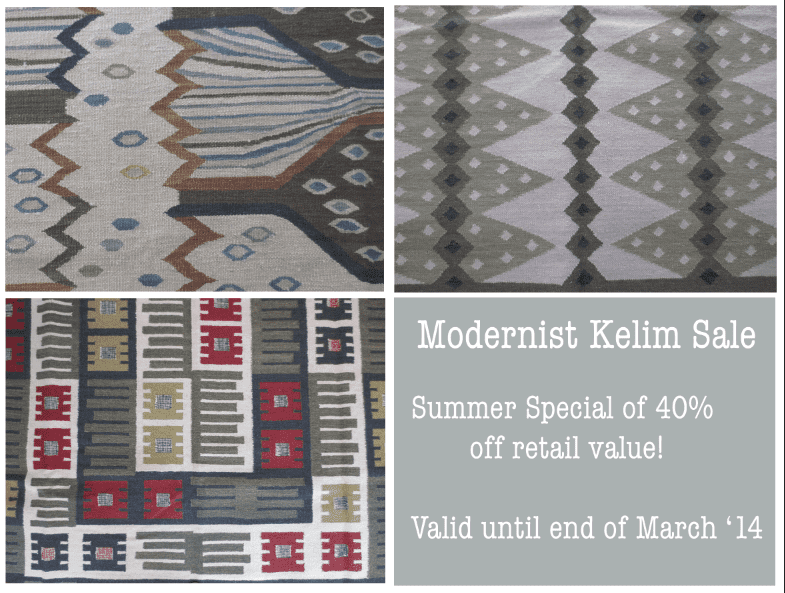 A limited inventory of unique Kilim designs is now available at a Sizzling Summer Special of 40% off their retail value. Visit us at our De Waterkant showroom to view theses 50’s modernist marvels at your leisure. Nothing creates more excitement here at Fibre Designs than the arrival of luxurious new designs. Autumn is just around the corner and so is our exciting new collection. The ‘Artists Collection’ is the culmination of two highly creative skills: Firstly pure white Art-Silk rugs are individually hand-knotted followed then by each piece being uniquely hand painted with textile paint by the original artist himself. Each piece therefore being unique and an artwork in itself. We’ll be sure to update you as soon as they arrive! 2012 was seen as the year of chaos – from natural disasters to political upheaval. The need for calm is expressed in themed spaces of clarity and purity. Design takes on an atmospheric theme –influences lie in meteorology showing molecular structures with metallic highlights. Say “yes” to the future – Space age looking forms and formulas. New Naturals – we still have a tight hold onto nature in our technical age. Wood is still ever popular, even in prints. Animal Planet – reclaiming what we are losing. Think in-your-face taxidermy, skeletons in Victorian bell jars and animal trophy heads (thankfully made of cardboard or cheekily out of old stuffed toys). 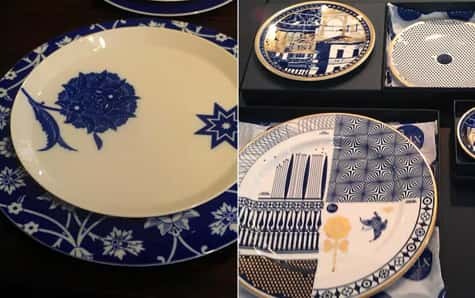 Obsession with being global citizens – World capitals show up in napkins, wall tiles and scents. Maps maps maps! 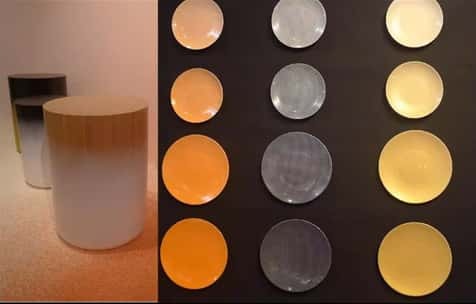 New Tactility – new advances lead to unusual textures – stingray skin implanted into metallic tables and moulded into bowls. Muskin introduced – the skin off the head of a large mushroom! Breathable and water repellent. Brand Service – 70% of consumers are more than willing to spend their money on brands that offer good personal service. Purchase Proudness – make sure that your brand service matches your product and that clients are proud to take your products home and talk about them. Future of Retail – the shop is now a showroom. With online purchasing the shop may not be the end line of purchase. New Purpose of Sales Staff – advise and consult. Staff are selling solutions, not just products. We hope you found this as informative as we did following the numerous talks and discussions around both events. 1) Outlined and Edged – furniture gets graphic outlines within its borders as well as display sets and ceramics. 2) Faceted and Geometric – items are broken into linear and angled shapes, geometry being the leader. The rug on the left of the image below is a piece we designed and placed in a very happy client’s home. 3) Fluted – from ceramics to furniture and lighting, they all got the natural floral-like flute. 4) Boxed and Displayed – if it’s worthy to be on display then the display is worth getting right, and subsequently becomes a display on its own. Also – items that are regularly on display but may not have been given much aesthetic thought (eg: dustbins) are now being shrouded in elegant and attractive designs. Have a look at our very own Beauty Fires to see how fireplaces are being redesigned to become collector’s items in their own rights. 5) Uplifted Basics – simple crude designs get refined. Wooden crates being made from refined,quality wood but it still has the form of a crate table. On the right you’ll see our rustic hemp neatly hand crocheted into delicate-looking but hard wearing floorware. 6) Neo Nature – synthetic and nature combine to create fun uses and aesthetics. 7) Outdoor Havens – the outdoors is seen as another room and treated accordingly. We’ve been shouting this from the hill tops ever since we bought you our Verandah Collection (pictured below, left). 8) Soft – materials become emotional but unusually so. Reptile skins become cuddly and are seen in the likes of velvet alligator skin (bottom left) and place-mats which look like marble are in fact soft, pliable pieces of perfection. 9) Metallic – a continuation of what we have been seeing but a mix of metallics, often with natural products, takes pride of place here. 10) Show-lights – lights are become the focal point, lots of detail given in scale and colour. Showmanship is rewarded here. Speaking of which, have you SEEN the luminescence of the lighting available at The Modern Home Company? Do yourself a favour and have a look at their incredible designs. Watch this space to find out more from the webinar on colours and patterns as well as Dion Chang’s Flux Trend Report from the point of retail business. Salone del Mobile 2012 was a feast of creativity at every corner – literally. Besides the yearly trade fair, held at the Fairgrounds in Rho, Milan also hosted the Fuori Salone (roughly translated to “outside the salon”) – a satellite gathering of exhibitions which spread from the centre of Milan to the Lambrate district and Zona Tortona area. This meant that everyone from hairdressers to shoe shops joined in by collaborating with designers to showcase chairs, mirrors, lamps and more within their own spaces. We were lucky enough to stay in the enviable Brera District right in the heart of the Fuori and therefore got to see a lot of these exhibitions on our very own doorstep. The fair itself was trade focused on the days we attended and it was great to do meet and greets with a few reputable names within the furniture industry. 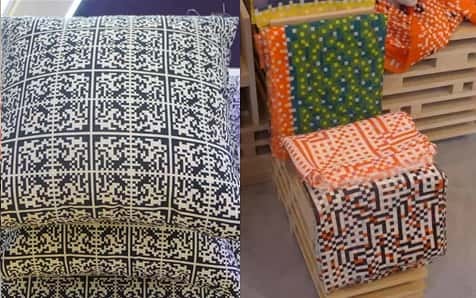 It was also rather ego-boosting to see that ourselves, along with the rest of our South African counterparts in design, are very much on trend with our products and offerings. Getting to see predictions of what is still to come was both valuable and exciting. Most interesting to me was the approach of design to not only cater for obvious purposes but to to keep in mind the creature comforts we customise our products into serving. Two of my best picks were the Decafe Lighting range from Raul Lauri (www.rlauri.com) and Casamania’s Collerette chair (www.casamania.it). Raul uses ground coffee as his base material for the Decafe lights – in his own words he finds it “gives a second life to ground coffee as a biodegradable and renewable material while taking advantage of its emotional aspects”. Best of all, with one flip of the light-switch you have the faintest smell of your favourite morning java wafting through the room. Have a look at our Facebook page to view a few more images from our trip. Salone del Mobile 2012 here we come! We’re a little flustered here in studio with all the excitement of our upcoming travels.Fibre Designs is excited to be attending Salon del Mobile 2012 in Milan, Italy. Although we primarily focus on textile designs, we’re always keen to stay ahead of trends when it comes to design as whole. So with that in mind we are off to scout the halls of the Milan Showgrounds in search of inspiration that will further our expertise and in turn bring back a wealth of knowledge for our clients and work colleagues alike. Follow us on our Twitter handle – @FibreDesigns – to see what we discover each day, we promise to keep you up to date with our discoveries and experiences along the way. 03cubed. A different look at design. Fibre Designs, Modern Home Company and Beauty Fires have joined forces to bring you our new Johannesburg showroom – 03cubed. 03cubed is a powerful combination of three of South Africa’s luxury brands offering exclusive interior and exterior furniture, lighting, fires and floorware in a distinctive curated space. International and local pieces merge and complement in regularly changing room settings to show design with soul, passion and flair. A personal trip to Paris and London turned out to be a design feast of note – Paris Design Week as well as London Design Festival happened to fall during my planned weeks of exploring these two beautiful cities. First on the agenda was Paris. I reveled in the unique concept store that Citroen had to offer on the Champs Elysees. The incredible 6 platforms carry different models of Citroens while the red illuminated stairs upon entrance lead visitors down to a 4D cinema for virtual adventures inside one of their creations. The faceted entrance does not mislead the structural genius of the interior where brand and architecture seamlessly unite – definitely worth a visit, car fundi or not. Rue de Raspail was a treasure chest of style and design. La Lumiere partnered with Foscarini to showcase innovative lighting solutions that could have definitely made their way home with me had I the space or wallet. Another fascinating find was the Sentou store at 26 Boulevard Raspail. 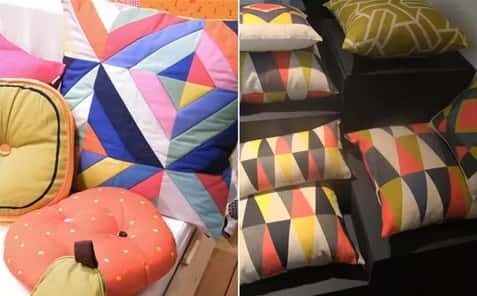 Showcasing a range of designers from across the world, their bright and quirky designs were right up my alley. I even found Shine-Shine fabric there! Further along the street I fell into the Alessi store – a definitve one-stop shop for anyone looking for the unusual in homeware. My best pick was their sushi crockery. Edifice housed the favourites of yesteryear with a few giants leasing the biggest attractions from their store window. I personally fell for these circular hanging screens and a very unusual lamp dedicated to the heart as a muscle and an effigy. Unfortunately due to time constraints and a lack of presence from the Design Week itself I couldn’t see much more than this. The city herself made up for this though and the rest of the time spent in and around her old streets and buildings was nothing short of magical. Fibre Designs was proud to be showcased alongside Modern Garden Company on the Expresso Morning Live show. We are clearing space for our exciting new “Colour Reform Collection” so don’t miss out on our Summer Sale. Now is a great opportunity to get from 20-70% off on some of our beautiful hand-knotted and hand-tufted items. Included in the selection are bast fibre rugs (ideal for high traffic areas), super comfortable wool structure rugs (ideal for your lounge and bedroom areas), flatweaves and kilims and quirky jacquard design patchworks. 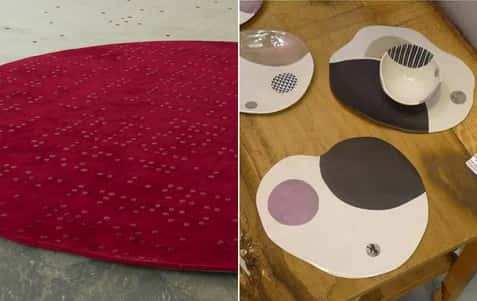 Li Edelkoort’s seminar at this year’s Design Indaba was particularly informative and the Fibre Designs team were excited to distill the international trend guru’s ideas into what is relevant to the world of floorware. Colours of 2011 are inspired by the earth so we’re likely to see sandy yellows alongside water derived colours like swimming pool blue and indigo. This is a great inspiration for us, as we have just conceptualised a new range dubbed “Colour Reform” – we’ll keep you posted. Fabrics are silent and organic and we should see the rise of mohair, wool, cashmere and linen. Again, we are spot on trend – our collaboration with Mohair South Africa will have you crawling on your knees! Our extensive wool collection is also seeing great innovation and new structures will soon be available. Retail and product development will move towards better satisfaction for the client so we should see calmer shopping spaces, where the client leaves with exactly what they desire, and where they are involved in the customisation and design process of their purchase. Fibre Designs picked up on this trend when we opened our doors just over 5 years ago. The entire ethos of our business is to allow full customisation where client and designer can work together to achieve a truly bespoke item. Your vision, alongside our experience should ultimately translate into a reality that you would be proud to invest in. The differentiation of interiors on the inside and landscaping on the outside will become more blurred, and as a result furniture and floorware will move outdoors and pebbled sculptures and landscaped carpets will come indoors. Our new outdoor range, The Verandah Collection, supports this trend and we are currently in production of our first prototypes – with client orders already streaming in. The consumer will be invited to landscape their interior as if it were a garden or outdoor space. The grasslands will be a source of floorware inspiration so expect to see woven grasses and knotted reeds. We were delighted to hear this as our bast fibre (hemp) rugs have taking off at a rapid pace – clearly our clients are on top of the trends too! Finally, texture and tactility are back in our attempt to reconnect with real products and thus knitted texture in a sculptural form will be evident, particularly showing off the do-it-yourself and handmade element of product design. We simply cannot wait to show you what we have in mind for this trend prediction – we’ve been spending time abroad doing product research and development and will soon be bringing these on-trend items to the market. Li Edelkoort’s trend forecast is an enlightening experience that creates the pulse we keep our design fingers on. 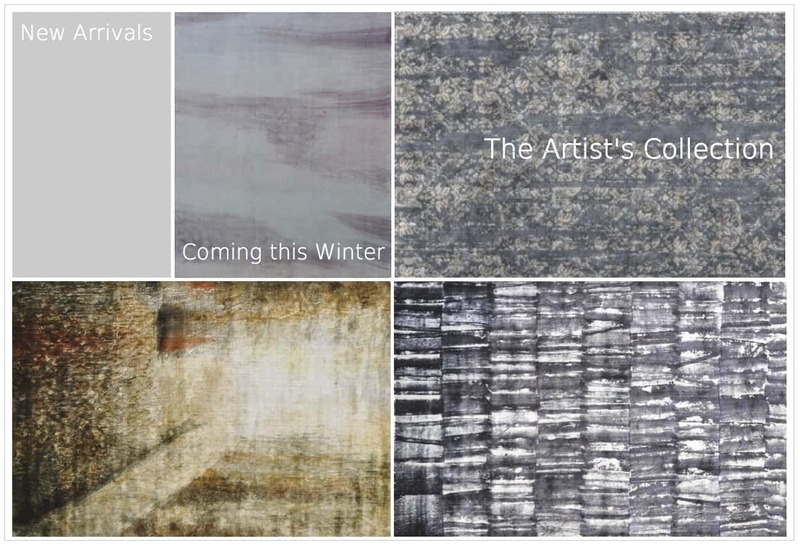 In many ways it affirms the direction we at Fibre Designs follow – our products for 2011 supports global trends without losing the timeless appeal our rugs are loved for. 2011 is proving to be a year of growth and expansion for Fibre Designs. We are delighted to now offer our bespoke services on a personal basis to all Johannesburg clients and welcome our latest team member Victoria Tucker. Victoria has extensive knowledge in the design and retail sector and holds a passion for all things design based. She will surely bring a welcome zest and warm presence to the Fibre Design experience in our city of gold. As always, please be assured of our personal and very best attention at all times. Fibre Designs has been named as a finalist for the 2011 Hali / Domotex International Carpet Design Award in the “innovation” category. The “Meta” rug from our Visual Silence collection transforms what is often thought of as naive design into a sophisticated, high-end product through the inventive use of humble materials in combination with sophisticated weaving techniques. The motif, which makes reference to ancient tribal bark-cloth panels from designer, Pierre Antoine’s Central African roots, is re-interpreted for contemporary environments by using un-spun hemp bast fibre pile in authentic colours – which is then finely-knotted to deliver a carpet with a crisp pattern and pile height of great finesse. “Meta” sits comfortably in both sophisticated modern interiors and brings refined glamour to more relaxed or rustic interiors. The recently launched sister-company to the well-established Modern Garden Company – Modern Home Company offers elegant, sophisticated (and occasionally playful) furniture for high-quality interiors. This shared design philosophy makes perfect sense and Fibre Designs recently partnered with Modern Home Company. Visit Modern Home Company’s showroom in Green Point where some of our iconic rugs can be seen.